Beautiful bed sheets, don't you think? Tonight, I accomplished a major creative feat by completing the layouts for Act 1 of Badin and the Secret of the Saami. The price was expensive, however. The lack of sleep with a compromised immune system response to a virus, slapped me with a 3 day sore throat, cough and aches. I did it all for you Badin. I did it all for you, Sweden. 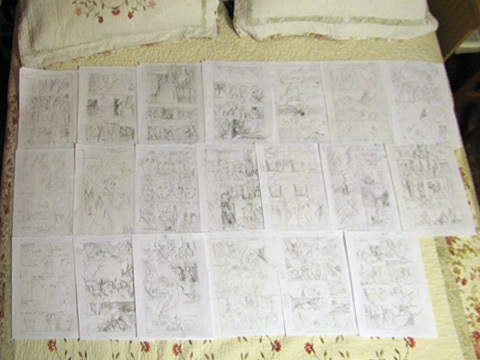 The picture at left is all the thumbnail sketches (some pages have multiple versions, but they are stacked and not visible). These are my blueprint for the pencil drawings and lettering. So I don't spoil your fun, it is a very small picture with poor resolution. Some magical moments occurred during this process. Unfortunately, I cannot reveal what happened. However, the picture portion of the story telling took me in a few subtle directions that enhanced the script. I am glad to conclude this portion of the production because I needed to see if I could truly accomplish this difficult task. I understand better why this is the most fun part of illustrating comics. I "directed" the illustrations in the full script. It really helped. However, I did not hesitate to change it—or improve it. Next step: Complete the thumbnail layout for Act 2. I have now started a regimen of getting to bed by 10 pm. Getting sick is not something I can afford to repeat. The downside is that I am spending much of my days off working on this graphic novel. If you are interested, my day job is heading a photo retouching business and a stock illustration business.